The Most Comprehensive Set of Federal Form Jury Instructions Available. Case Authority and Guidance Right at Your Fingertips. With examples drawn from all circuits and the Supreme Court, Modern Federal Jury Instructions is useful in any federal court. Frequent citations to the text of other recommended instructions, particularly Pattern Jury Instructions of the Fifth, Seventh and Ninth Circuits and the Federal Judicial Center are major features. Build Credibility in The Courtroom With Instructions Cited by Judges. 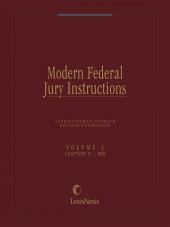 Modern Federal Jury Instructions contains five volumes of form jury instructions for use in a wide variety of actions and proceedings in federal court. Each form is supported by citation to relevant case and/or statutory authority and is accompanied by explanatory comments and analysis. It features instructions for use in criminal proceedings and civil actions. The form instructions in Modern Federal Jury Instructions are not only legally precise, they are also easy for the jury to understand since they are written in plain English. At the end of each instruction, its authority is clearly stated with supporting cases distinctly identified by circuit. Explanatory comments provide a clear explanation of the law, supporting the language of the instruction, and plainly point out any conflicts between the different circuits. With quarterly updates, Modern Federal Jury Instructions, is more current than any other publication in the field. Not only is Modern Federal Jury Instructions useful to attorneys in the courtroom, it is also valuable to litigators who seldom try cases before a jury. The instructions for a particular crime or civil action provide an excellent blue print of the facts that need to be proven. Ready-to-use jury instructions for any federal civil case. • General instructions covering such areas as evidence and burden of proof. • Specific instructions spanning every significant area of federal litigation, from federal securities regulation to patents and civil rights. There is simply no other guide as authoritative and all-encompassing to help you minimize errors, focus the jury's deliberations, and produce instructions that stand up to even the sharpest scrutiny down the road.